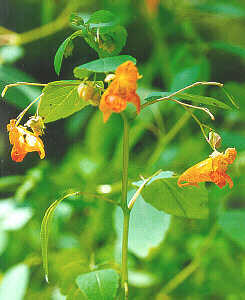 Jewelweed grows in wet, shady, or partially sunny areas, including meadows, woods, and wetlands. It can grow up to 3-5 feet tall, and has oval, round-toothed leaves, with small trumpet-shaped flowers that look like jewels. Jewelweed is anti-inflammatory, anti-histamine, and anti-fungal, and has been used for centuries as a remedy for poison ivy. It is often found growing right next to poison ivy. It also been used successfully to treat other skin ailments, including eczema, bug bites, nettle rashes, and fungal infections. Jewelweed is most effective used as a fresh plant poultice (rubbing the juice from the broken stem and leaves onto an affected area can cause immediate relief), but can also be an effective medicine as a fresh plant preparation, such as a salve, an infusion in witch hazel (external use only), or as a skin wash. This website has a lot of information about jewelweed and has a number of different uses listed. The leaf, stem and flower of jewelweed are used medicinally. One of the best ways to preserve the medicine of jewelweed is to freeze it. Make a strong tea of the jewelweed by simmering the stems and leaves in some water until the water level has reduced by half. Allow the tea to cool, then you can either blend the mixture to really extract all of the juices from the stems or you can just strain the tea at that point into ice cube trays for freezing. Once the cubes are frozen, store them in a sealed bag in the freezer. The ice cubes can then be used frozen onto the affected area in need or thawed and used as a compress (use a wash clash to apply the liquid). Jewelweed can also be used immediately. Squish the leaves and rub directly on the skin where needed. You can also blend jewelweed and strain out the juice for immediate use or refrigerate to use within several days. Jewelweed spoils quickly. Jewelweed can also be extracted in oil or made into a liniment, extracting the plant in witch hazel or rubbing alcohol to be used topically. To make a liniment fill a jar with jewelweed and cover with witch hazel or rubbing alcohol and allow to sit for 4 weeks. When the liniment is ready strain and either dab on desired area with a cotton ball or use in a spray bottle. Cautions/Contraindications: Using jewelweed internally is not recommended.